Gilbert already had three of the five Monuments to his name after having won two Giros Lombardia, Liège–Bastogne–Liège and the Tour of Flanders. He added a fourth with a powerhouse performance in the 257km queen of the classics, out sprinting 25-year-old Politt after a dive down the track. The boss and the star of the show! “I am extremely happy," the Belgian said. "I was disappointed after Flanders, but in the week leading to Roubaix I returned to training and focused on (it). "I came into the race with pressure, because I was very motivated to overcome what had happened last Sunday and go for the win, especially as I felt that I had good legs. Numerous moves tried to break free of the peloton's grip early on, but nothing stuck until well into the race, when a 18-strong group, including eventual runner-up Politt, threatened to send a number of dangerous riders up the road. The risk present in letting the breakaway gain too much advantage motivated a number of teams to keep the gap small and the break's lead never extended beyond a minute. 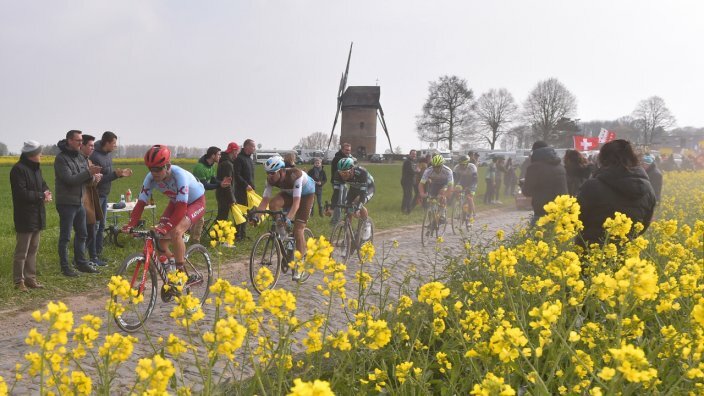 Crashes and mechanicals in the opening cobbled sectors split up the race significantly, with pre-race favourites like Alexander Kristoff (UAE Team Emirates), Peter Sagan (BORA-hansgrohe) and Wout van Aert (Jumbo-Visma) caught out and being forced to make up ground. Van Aert in particular had a bad run of luck, having a mechanical, changing bikes twice and crashing on a seemingly innocuous section of road. He managed to make his way back to the field and was even able to respond when Sagan launched his peloton splitting attack on the Auchy-Bersee cobbled sector with 53 kilometres to go. Only van Aert, Sep Vanmarcke (EF Education First) and Yves Lampaert (Deceuninck-QuickStep) were able to follow the move, which picked up previous frontrunners Politt and then Gilbert. The group of six cooperated well together to distance the flagging peloton, and steadily pushed out the gap to over a minute as the race hit the decisive pave sectors. Gilbert unleashed a series of attacks, which Sagan took upon himself to cover, but in the end it was a surge from Politt that proved decisive, with Gilbert's counterattack over to the German forming the winning move of two. Gilbert proved the cannier and the faster of the pair in the final dash to the line, taking the win and the famous trophy. Lampaert took third after van Aert and Sagan fatigued, and Vanmarcke stopped with a mechanical to change bikes.